The new guide from BCAS is designed to simplify the selection of the correct air treatment equipment. The British Compressed Air Society (BCAS) has launched a free best practice guide to help operators and specifiers make an informed choice about which type of compressed air treatment equipment is best suited to the air quality required. 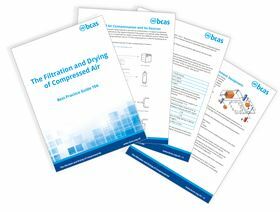 The Filtration and Drying of Compressed Air is a 60-page guide which is available for free download from the BCAS website and has been produced with the input of leading engineers from BCAS members in the field of air treatment and purification. It is designed to simplify the selection of the correct air treatment equipment and provide practical advice on which contaminants can be present and their impact on the processes that compressed air is being used for. He added that the guide covers all stages of system design; from an overview of the sources of contamination, such as solid particles, water and oil to the relevant standards for air purity. It also examines the extensive range of air purification technologies available. ISO standard best practice guide.